I might have a case of bad Google-fu this morning..
What are the Linux software alternatives for programming SAM memories? My first target is a SAM D20 so no USB on chip, Thus, I'm primarily looking for a non-bootloader solution. The D20 is on a Xplained Pro board. Also have one Atmel-ICE and one Atmel SAM-ICE. EDIT: ...and OpenOCD can apparently be used (only fount hints to this so far, so need to dig further). EDIT: According to Atmels and Microchips webs the Atmel SAM-ICE does not support M0's (support listed is "SAMA5, SAM3, SAM4, SAM7 and SAM9 ARM"), so it'll be the Atmel-ICE. Mmmmm... The abbreviation I know roams out there in the ARM wilderness, that I have a slight fear of, and that I've tried to avoid up til now. Well, seems the time is due to muster some courage, a sharpened pencil and a stack of paper, a new LibreOffice document, Then go out onto the vast Web, track the beast down and take it on. I use a Jlink edu which both 'JLinkExe -device AT91SAMD11D14A -if swd' and OpenOCD work. To write I use QtCreator with JLinkGDBServer. 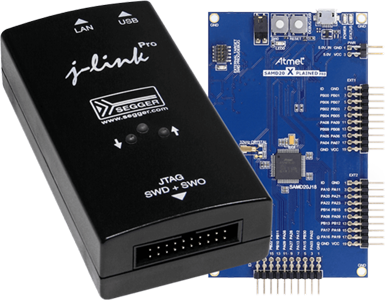 SWD and JTAG are hardware interfaces between a debugger/programmer "box" (loosely speaking) and an ARM chip. They provide a standard method for the debugger to talk to various registers inside the ARM CORE. CMSIS-DAP describes a standardized higher-level interface between a USB Host (like your PC) and an ARM SWD/JTAG Debugger. Theoretically, debugging SW on your PC can support CMSIS-DAP and be able to talk to ANY ARM chip (given an appropriate "box" that also supports CMSIS-DAP. Apparently it is flexible enough to support encapsulation of non-ARM stuff as well. It's probably not the fastest way for a debugger to communicate with a PC, but it's standard!